Available from Amazon or many out of print dealers of angling books; this volume can also be viewed on-line through the Open Library. 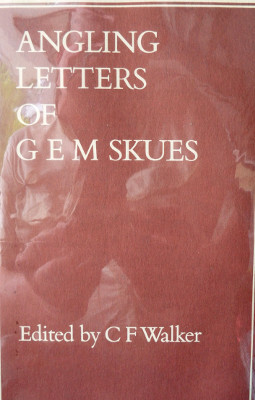 This is indeed an enticing book which allows us a better glimpse of the man behind the myth of G.E.M. Skues also much of the information in these letters has remained unpublished until the letters were edited by C. F. Walker. Most of the letters cover the time period from 1932 to 1949, many individuals that had letters from Skues could not part with them for even a short time and many letters that Skues had were lost or destroy during the Second World War. As a side note, many letters and journals of fly anglers are destroyed upon their death and thus much information and fly fishing history is lost, and this is a sad fact of life. As a serious student of fly fishing history I have found this book to be a wealth of information and I truly believe that to understand the anglers of the past is to better understand the fly fishing conditions we presently enjoy and allows us to better prepare for the future. Besides, to date I have yet to read anything written by Skues that did not include a wealth of information for the modern angler to absorb. Walker has screened the letters to omit personal details and retained the information that deals with the subjects of fly fishing. In Skues day much was written about remaining out of sight of the trout that was being worked, yet upstream presentation methods were dominating fly fishing during those years, both in actuality and in print. There was no real magic, in fact Skues through his observations understood the trout and fully understood what would actually spook the trout, rather than the perceptions of what spooked trout. These are just some of the delights that awaits the reader within the pages of this volume, as I stated earlier, this book contains many lessons and will give the reader a much clearer picture and understanding of one of the great angling minds of all times, a man who inspired a great many of the future angling greats that we read and admire today. Skues didn’t care to be classed as an Authority, because to him it was a term of finality and tended to close one’s mind to other truths, he believed that there was always something new to learn and absorb for the individual angler and the fly fishing community as a whole. One thing that comes through in the letters is that Skues was obsessed with creating and presenting the best imitation possible to the feeding trout and he gathered information from his own observations and through the correspondence he maintained. Walker also offers his views and comments on the published works of Skues and notes that for a man who work at his profession as a lawyer until he was over eighty years old, his literary output was astounding and this must be coupled with his ongoing correspondence with many anglers in a number of countries. Delving into this volume will enrich your angling life and give you plenty to discuss and consider as you travel the course of fly fishing history, I highly recommend this volume to all who have the desire to study the historical fly fishing events as I do.